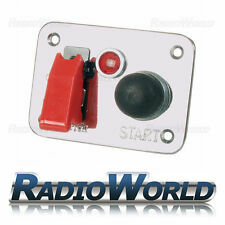 UNIVERSAL 12V PUSH BUTTON IGNITION SWITCH PANEL. Ignition On/Off & Start Engraved. 90mm (Length) x 65mm (Height). Description: High quality carbon fiber face plate 1 ON-OFF redc toggle switch 1 x red engine start button 3 x toggle switches for additional use Come with the Relay to control the buttons of this item Pre-drilled mounting holes design is convenient for installing. Ideal for any speeding &racing vehicles:car or boat etc. Feature: Material: carbon fiber face plate Color: like the picture show Quantity: 1 set. INSTALLATION:- This product requires professional Installation. Description:-Blue Light How to wire： 1.Two Blue Wire：to ACC Line and Start Line 2.Red is Postive,Black is Negtive Or see my pictures . To Start Engine: 1. Use your key to turn the ignition key on. 2. Press the installed switch to start engine. Release as soon as the engine fires. Specifications: DC: 12V (Fits for all vehicles) Dimensions: Outer Diameter for the ring - 3.7 cm (Dia) / 1.46 inch (Dia) Inter Diameter for the hole - 3.0cm (Dia) / 1.18 inch (Dia) The same size as for a standard Cigarette Lighter Slot Package Includes:- One Engine Starter Switch Blue Light One Relay Box One Plastic Outer Ring (Black) All Accessory as my picture showing. Switch type toggle. A Heavy Duty on-off switch. Body colour black. Button Marking n/a. Rated 25A @ 12v. 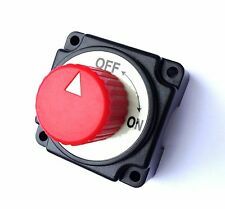 On/Off Toggle switch with Red Aircraft style cover. Ignition On/Off & Start Engraved. Panel Size 9cm x 7 cm. Centre Off. Double Pole. On/Off/On Latching (all fixed position not spring back). Round fixing hole 12.5mm Dia. Switch type toggle. Includes Missile Cover for added Style and Protection. Body colour black. Switch type toggle. Body colour black. Button Marking n/a. Fits Round Fixing Hole 12.5mm Dia. Switch type toggle. 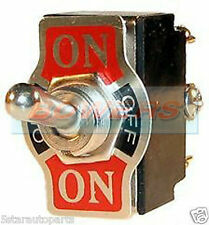 A Heavy Duty on-off switch. Includes Waterproof Protection Cover specifically designed for this switch. Body colour black. Button Marking n/a. 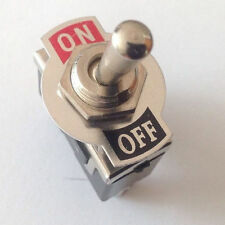 1 ON-OFF redc toggle switch. 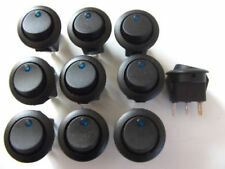 1 x Car 12V Ignition Switch Panel Full Complete Set. Universal fit all vehicles(12V). Pre-drilled mounting holes design is convenient for installing. Face plate: carbon fiber face plate. Protection class: IP65 IK08. Installation aperture: 16mm. Operation Type: Reset. 12V DC for LED only. Shell material: Brass nickel plated. Centre Off. Fits Round Fixing Hole 12.5mm Dia. On/Off/On Latching. This is the standard doorbell switch. Removable Waterproof Cover (as shown in picture 3). Switch type: Push Button. Switch type ROCKER. Electrical life 6000 cycles. Body material polyamide. 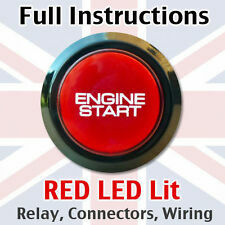 MotorsportPush Button Red Illuminated Starter Switch. 34mm at the widest point. PUSH BUTTON SWITCH High Quality on off switch Returns to position after pressing Momentary functioning switch, so the push button returns to its normal position when you take your finger off Twin terminal connection. CNC Machined Alloy Bezel and Collar (Brushed Steel) 25mm Diameter Head size 28mm Underhand depth including the terminals can be fitted into a 18mm hole size Additional relay may be required to take the power amperage. 20 AMP MAX ( with no relay ) FAST DISPATCH PLEASE NOTE Important notice BEFORE ordering Please DO NOT rely on the compatibility list to make your decision of parts, as cars come with many variations and fitments on the same make and models. Check things like dimensions size and other stated fitment criteria prior to ordering to make . Round fixing hole 7mm Dia. FITS AN 26mm ROUND HOLE. 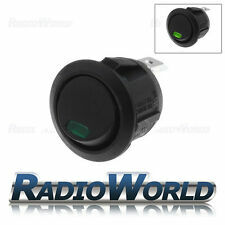 12V PUSH ON BUTTON SWITCH HORN CAR DASH 12 VOLT. Actuator colour: Black. Body colour: black. Perfect for Competition Cars. 1 X Push Button. - Easy to fit. Color: like the picture show. - Fits in a 22mm hole. 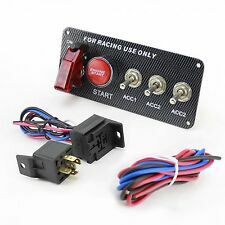 12V 24V Racing Car Ignition Engine Push Start Button Carbon Fibre Panel Switch Kit. 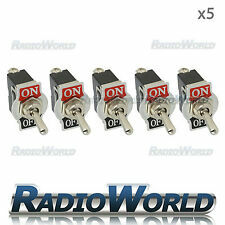 Switches:1 x On-Off Red Toggle Switch, 1 x Red Engine Start Button. Panel material: Carbon Fiber Board. Flip switch is rated to 20A, 12V DC, push button rated to 50A, 12V DC. A special version of the standard SPDT switch. It has a third switching position in the centre which is off. Includes Waterproof Protection Cover specifically designed for this switch. Switch type toggle. Perfect for Competition Cars. 1 X Push Button. - Easy to fit. Color: like the picture show. - Nice quality. Waterproof Cover (Cap). 3 Position (park, off & on positions plus crank). 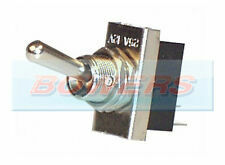 1 Toggle switch with aviation cover 1 Engine start push button 1 LED indicator. With toggle switch, aviation cover, easy to use. 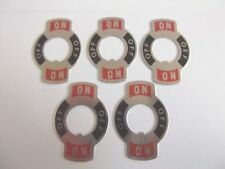 Product switch group: two sets - 1 ignition switch 1 toggle switch. 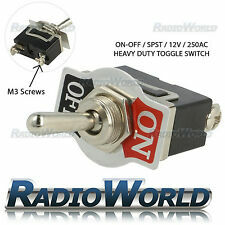 UNIVERSAL 12/24V OFF/ON/ON ROTARY SWITCH. Ideal as Headlight or Fan Switch. Round Fixing Hole 14mm Dia. Off/On(1)/On(1 2). Rated at 40A max. Type of switch:ROCKER. Button marking: Heated Seat and indicator. Illumination:LED 12V DC, point. Key button colour:white. Body colour:black. Backlight colour red/yellow. 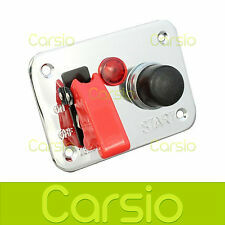 UNIVERSAL 12V PUSH BUTTON IGNITION SWITCH PANEL. Ignition, On/Off & Start Engraved. 135 mm (Length) x 65mm (Height). Pull-Push single pole switch. Ideal for classic look of a car, boat or motorcycle dash. Heavy metal chrome finish. New. 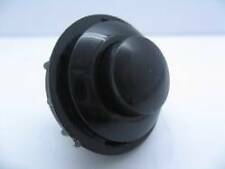 This is the standard Horn / Ignition type switch. 1 x Horn Button Push Switch. 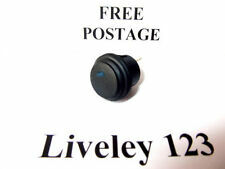 -12V 20AMP push button. Material: Diecast Aluminum & Plastic. We will try our best to reduce the risk of the custom duties. 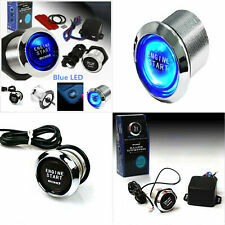 Universal Auto Car Keyless Engine Start 12V ILLUMINATE. The highly bright red illumination. 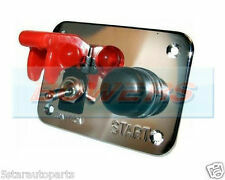 Engine Button Starter Power Switch Push Start Kit. The Engine Starter Switch allows you to start. Image are illumination purpose only. Quantity: 5pcs. Easy setup! All you need is a 21mm hole and the switch will sit in nicely;no more square cut outs. 2 poles design for (On/Off) 3rd poles with LED to be connected to earth. Light colour: Blue LED light.